In the first 2 Posts we looked at the individual Market segments. Let’s see how they come together to produce the Total Market from 2009 to 2014. The Market seems to have reached an “equilibrium” for growth with price increases in the 1.5 to 2.3% range. The problem is this is made up of different segments. It’s critical for Food to stay in this range. Will supplies prices continue to drop, stay flat or turn upward again? Pricing in the Veterinary market is depressing sales. The same could happen in Services as this segment comes into more widespread usage with the consumer. 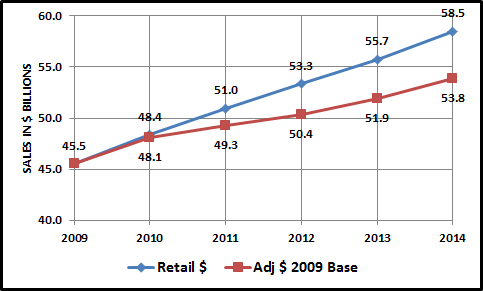 Veterinary Sales Adjusted for price increases actually decline in 2011 and 2012 and growth stagnates. Overall, 70% of Veterinary growth comes from price increases. Non-Veterinary Services have moderate price increases and strong overall growth during the entire period. – only 1/3 of Growth from price increases. However, it’s a small segment. Pet Food prices drop in 2010, helping to spark overall market growth. Then moderate CPI increases of 2.5% account for approximately 50% of growth. 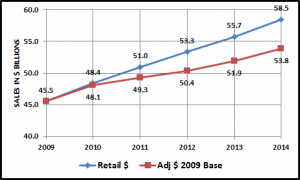 Pets & Supplies prices drop in 2010 and stay down – and even fall further. This spurs renewed and vigorous purchasing by consumers who buy even more, while paying less. Price drops in Food & Supplies keep overall CPI flat in 2010 – resulting in the strongest overall market growth in 7 years. Current growth – only 1/3 comes from price increases. Yes, the Pet Market has “bounced back” and is once again growing in the amount of products and services consumers buy – not just the Retail price we charge them. However, we have seen that every segment of the market has price sensitivity. It appears that a healthy Pet market requires an overall CPI increase in the range of 1.5 to 2.5%. Pet Food is of course the largest segment and the ultimately the “driver” of the industry. Because of the usage rate this is a very price sensitive segment. The consumer has shown that they will accept reasonable increases in prices just as they have in the human food & beverage segment – 1 to 2.3%. Quality is also of ever growing importance as Americans become more “nutritionally aware”. Pet Supplies is the other side of the coin. In the last 20 years this Segment has been systematically commoditized – one category at a time. Rawhide, tieouts, collars & leads, cat toys, dog toys…to name a few, are largely viewed by the consumer as commodities. And the list of “transformed” categories keeps growing. With a commodity, brands don’t matter. 64% of Americans now believe “Brand names are not better quality” (Time – 11/1/12). Only 25% of Americans consider Brand loyalty as a determining factor when making buying decisions. (Forbes 1/7/13) So the price becomes the only issue for the consumer. If the price deflation continues in this segment, manufacturers will need to run their businesses even more efficiently because of escalating price pressures. Of note: through May of 2014, the CPI for supplies continues its downward trend. The Veterinary services segment is an area of legitimate concern. Although retail $ have increased, the amount of services has essentially been the same for 4 years. We could see major changes in this market, with consumers moving to OTC remedies, the development of improved Pet Health Insurance to mitigate everyday costs, the creation of more Veterinarian groups and even Pet HMOs. This is what ultimately happened when Human Health Care Costs began their radical and continued upward rise in the late 60’s. So far the small, but rapidly growing Pet Services market has not experienced “hitting a consumer price wall” which has happened in every other segment. As this segment develops a broader consumer base, it becomes more likely that “price” will become an issue. Convenience – It’s a complicated life. Anything that makes it easier in regard to our companion animals. Selection – Americans always want a “choice”. 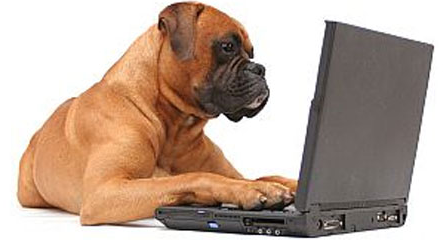 Each Pet business needs to take a hard look internally at how they do business. They need to maximize their efficiency in every aspect of the business in order to succeed in a Pet Marketplace which has become more consumer demanding and competitive.